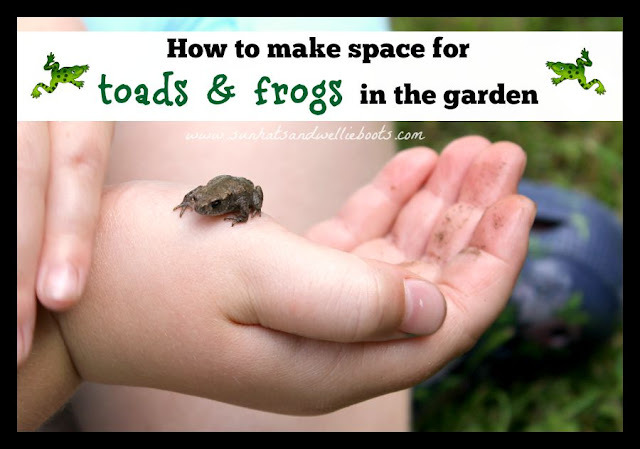 Why would you want to make space for toads in the garden? 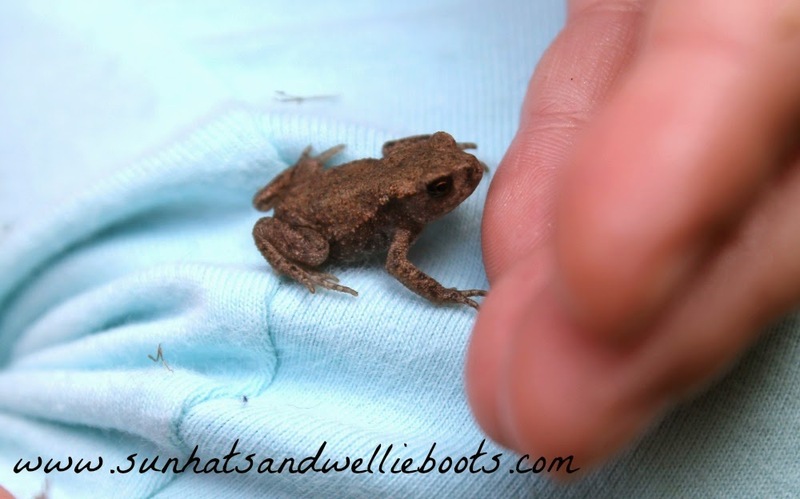 Surprisingly toads are a blessing to gardeners! This may sound strange to some but it's true. These amazing creatures are brilliant at providing pest control which of course makes them a very welcome guest in any garden or veggie patch which are so often plagued by slugs, snails, caterpillars & more. 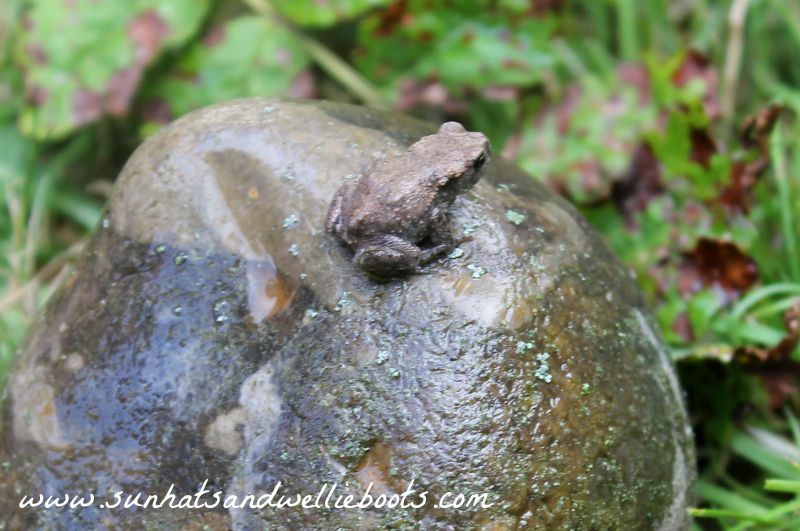 So how do you encourage toads into your garden? For the last few months we've been rethinking our garden & how we can create areas which will encourage more wildlife. When we've been cutting the lawn we've left several small areas of grass to grow wild & have been amazed at the results. Within these 'wild' patches of grass we've seen several types of wild flowers & clover & as a result we've seen more bees & butterflies hovering around the lawn. Yesterday however we made a new discovery in one of our wild areas & Minnie found a baby toad sheltering in a shady spot towards the edge of the garden. This got me thinking how we could offer more space for toads & frogs in our outdoor area. We don't have a pond in our garden yet so Minnie was surprised & delighted to discover this new visitor. 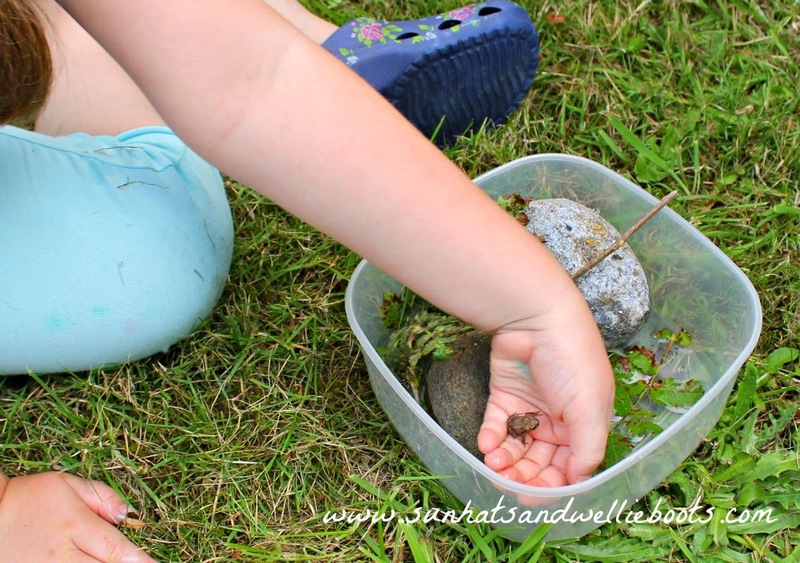 We talked about how amphibians live both on land & in water & that toads & frogs only need a pond during the breeding season when they lay their spawn, at other times they can be found in shady spots on land. 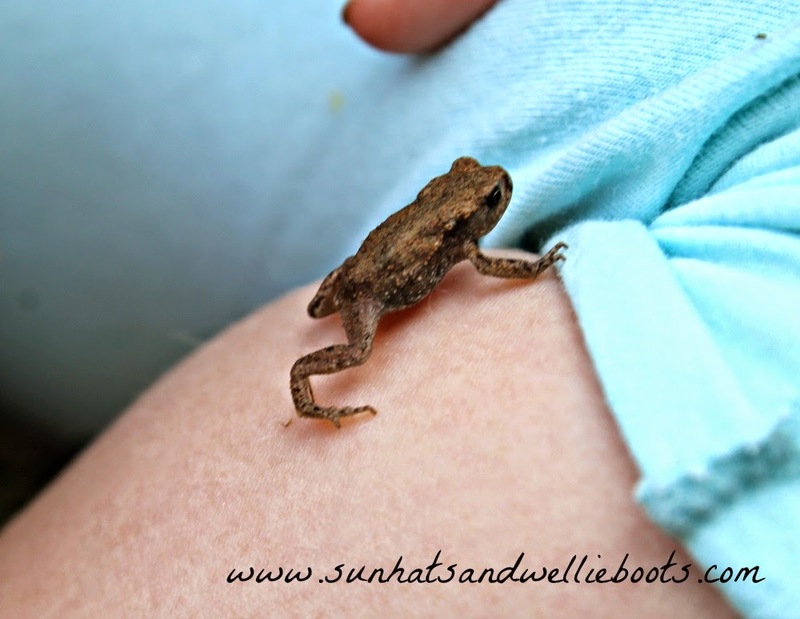 To get a closer look at her new garden visitor she carefully scooped the toad up in her hands & rested it on her leg. This gave her a real opportunity to see close up how it's body & limbs moved, as well as how nimble & quick it was. She wanted to make a little den for the toad so grabbed a nearby tub & instructed us to add a couple of rocks & some leaves. 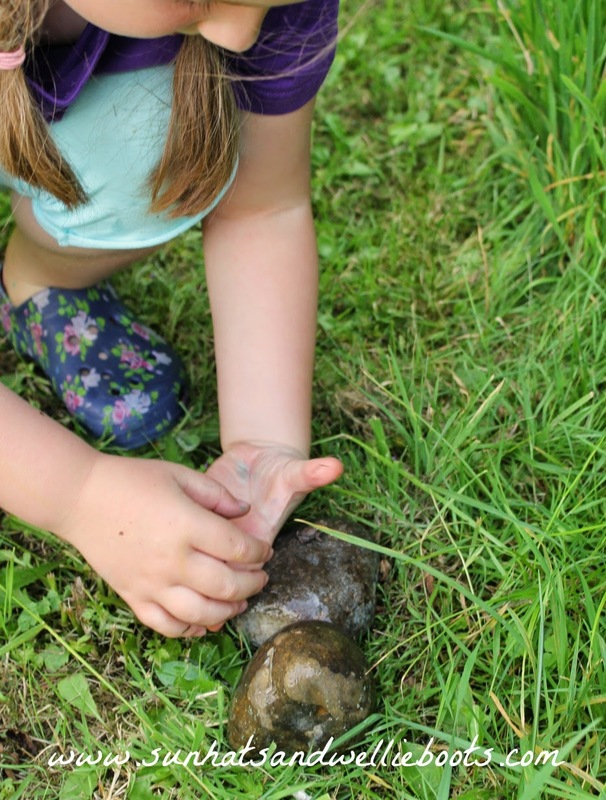 She gently lowered the toad in & watched with interest as it explored its new habitat. 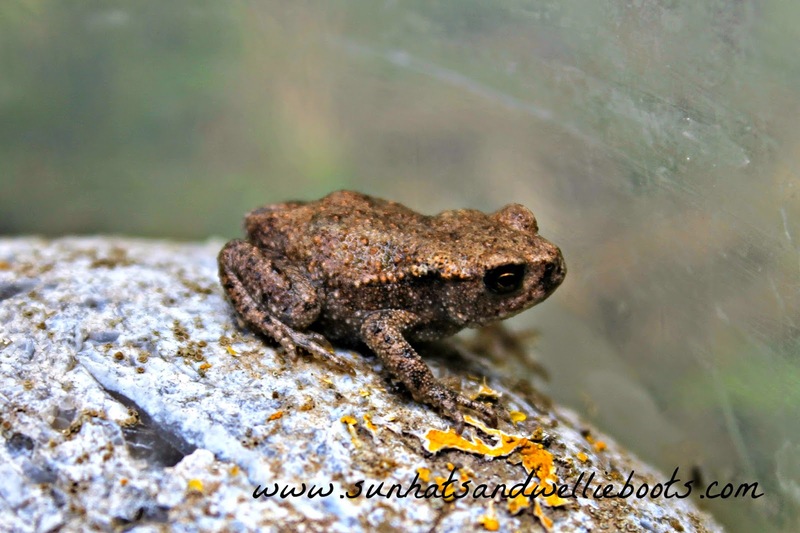 This gave her a chance to see how easily the toad could blend into its surroundings & camouflage itself, & gave us a chance to discuss why this was necessary for frogs, toads & other animals. After five minutes or so we let our little toad hop free again, & soon it was back in the cool shade of the long grass where it had sprung from. * Leave a small area (or areas) of your lawn uncut in shady cool spot in your garden. * Grow a selection of plants in your garden that will provide plenty of shade & moisture at ground level. * Create a small shallow ditch which can hold water or collect rainwater throughout the year. * Make sure there is a gap somewhere around your garden where toads or frogs can move to & from other gardens nearby. 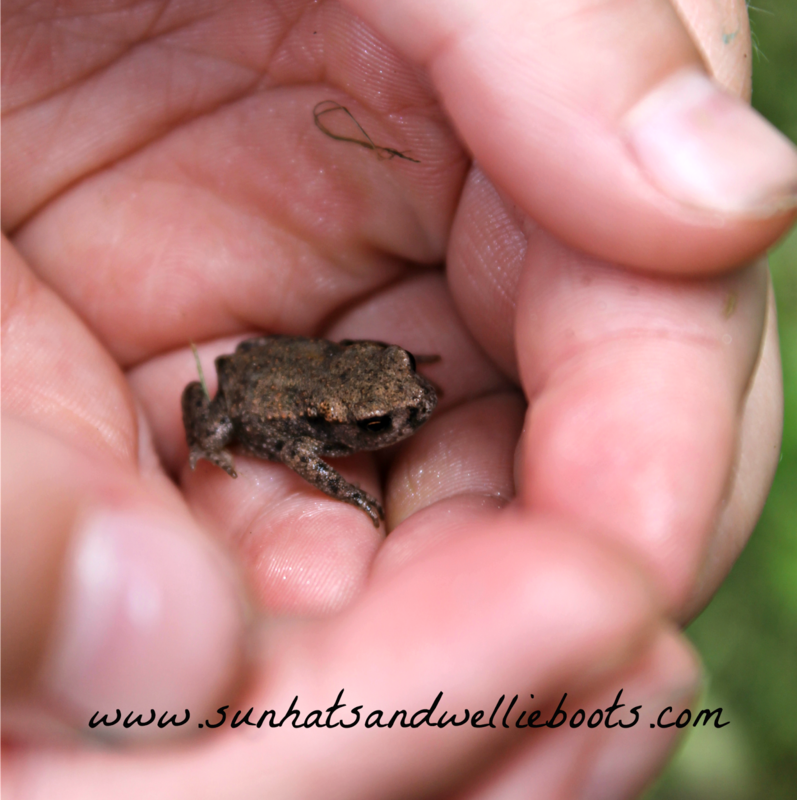 Our next project is to build a Toad Den in our garden close to where we found our baby toad, watch this space. If you found this helpful you might also like our Wildflower Rainbow, Mini Wild Meadow & Bug Spotter Sticks.